Items! 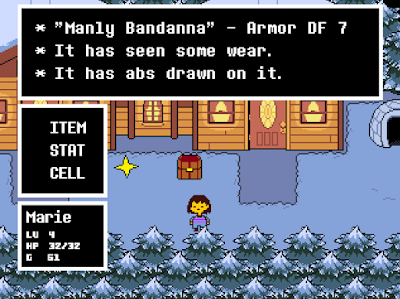 There are many items in Undertale. You can find them, use them, and throw them away, if you wish. This list covers all of 'em. Items in Undertale can only be sold to the Temmie vendor in Temmie Village. The sell prices here are only base sell prices; the Temmie will occasionally offer you a premium on items he really fancies. Reject the first price and accept the second. Try to go any further than that and he'll flat-out refuse you, with some slightly chilling results. Your starting weapon. All it does is allow you to attack. Yay? The alternate weapon in Waterfall. The Torn Notebook is a solid item, despite being weaker than the Ballet Shoes, because it grants you extra seconds of invincibility when you get hit. The second weapon in the game. Weak, but better than the Stick. You'll find it just before reaching Toriel's little house at the end of the Ruins. The third weapon. The Tough Glove allows you to strike multiple times by tapping the Z button. The more you tap, the harder you hit. You can purchase the Tough Glove in Snowdin, but there's no point, as you can find it for free in the first Box you encounter. Found on a ide area from the first set of hopping panels in Hotland. The Burnt Pan hits four times. Not much different from the Ballet Shoes. The major difference is the fact that the Burnt Pan will, when equipped, add an additional four HP whenever you use a restorative item. It would probably be great for a Pacifist run if you had more than twenty HP, but, you know, you won't. So. Purchasable from Bratty and Catty, outside the MTT Resort. It's an okay weapon, but not enough of a jump in quality over the Burnt Pan for the price. The best weapon you'll find in most runs, namely Neutral and Pacifist. The Worn Dagger is located in Asgore's home. By far the strongest weapon in the game, and needlessly so, since you'll only use it once. The Real Knife is found in Asgore's home during a Genocide run, in the same place you would normally find the Worn Dagger. The second piece of armour you can find. Worth grabbing, if you can find it. Look in the six pits near the end of the Ruins. More armour. You can buy it in Snowdin. Might as well. Yet more armour! You'll find it behind the first waterfall in Waterfall, in the same section as the falling blocks of ice. An upper tier of armour. The Stained Apron will heal one HP every other turn while it is equipped. This sounds underwhelming, and... well, it kinda is. You can replace this thing without much fear. Bought at Bratty and Catty's shop outside the MTT Resort, the Cowboy Hat is a good choice for people taking the Genocide route, as it bumps your attack stat by 5. You can get it for free when playing Genocide, too, which is doubly sweet. The best armour you'll find on an average run. You'll find the Heart Locket in Asgore's home on Neutral and Pacifist runs. It's good. The best armour in the game. The temy armor has fiendishly high defence, raises your attack, recovers HP every other turn, and increases the amount of time spent invincible whenever you get hit. Wear this and the rest of the game should be pretty easy. You can only get the temy armor buy sending the Temmie vendor in the Temmie Village to college (1,000 gold) and then buying it from him. The starting price is sad, but it comes down every time you die. Okay, this is the best armour in the game, but it's pointlessly strong. You'll only get it in a Genocide run, while looking through Asgore's house. Normally there's a Heart Locket here instead. Alas, poor Quiche. You can find the Abandoned Quiche by arranging the first set of Bridge Seeds to create a path along the water to the south. It's under a bench. Another freebie healing item. You'll find a cooler full of Astronaut Food (well, two of them) in the garbage dump of Waterfall, just before you fight the Mad Dummy. It's of limited quantity, and it won't be useful forever, but it's a great resource for Waterfall itself. Why would you want this? You get Bad Memories from Memory Heads, the weird amalgam creatures you'll encounter first in the True Lab. They'll put one in your inventory if you select Item as an Action. The first healing item you'll receive. You get it so early that it's actually considered a piece of equipment, at least until you equip something else. As far as I can tell it doesn't actually provide any defensive bonus. Seemingly a dynamic restorative item, the Bisicle isn't that great overall. Sure, you can use it twice, but that means you have to waste two turns to get the full effect. By the time you leave Snowdin it won't be very useful - which is bad, since you get it at the end of Snowdin. Shrug? One of the best healing items in the game. You'll receive the game's single piece of Pie by sleeping in your room at Toriel's home in the Ruins. It's a good idea to save this for fighting Asgore if you're on a Pacifist run, as it will hobble him for the entire fight. A simple restorative item, purchased in Snowdin. One of the better healing items on a Pacifist run, but it normally loses usefulness once you gain access to later shops. You can trade a Cinnamon Bun to one of the tenants of the MTT Resort for 99 gold. Not bad, not bad. Restoration! Not really worth the price, assuming you can avoid running out of Astronaut Food. No! Found at the MTT Resort's burger shop. Though it's an okay healing item, the Glamburger is pretty expensive. Buy one or two to use against Mettaton EX for boosting ratings. Otherwise, save your cash for something else. Eat the cats! Every now and then when you purchase a Hot Dog...? from Sans you'll get this instead. It's ever so slightly better. It... might be healthy? Hot Dogs are purchased from Sans roughly halfway through Hotland's outer section, not long after Mettaton's cooking show bit. If you killed Papyrus Sans will not be at his post, and you won't be able to buy Hot Dogs. He'll also disappear after you reach the MTT Resort. Give a Hot Dog to the mysterious person at the end of the hall in the MTT Resort and he / she will give you a Hush Puppy, which is much better. Well that's weird. If you take a Hot Dog...? to the MTT Resort and slide it under the last door in the east wing you'll receive one of these. They're great items, given the value added on top of the Hot Dog's healing. They're also great for selling, since you make a profit of 120 gold off each one, though Sans disappears from his Hot Dog stand once you reach MTT Resort. Yum, fridge goodness. You can find the game's one and only Instant Noodles in Alphys' refrigerator, in the Lab. Not the best. You'll find these at Bratty and Catty's shop, beside the MTT Resort. You'll get more value out of Hot Dogs...? or Cinnamon Buns. An unending supply of healing! Last Dreams only appear when you use the Dream Action during the battle with Asriel at the veeeeeery end of a Pacifist run. Every empty slot in your inventory will be filled with the things. They can help you get through what is, regardless, a fairly scripted battle. They'll remain in your inventory as 'Dreams' after the fight, and can be sold for quite a tidy sum, but by that point you don't need 'em anymore anyway. An early healing item. There are, as far as I know, only four in the game, all found early in the Ruins. A common restorative item. You can get Nice Cream from the Nice Cream Vendor, a blueish dude who travels between the regions. It's okay early on, but quickly gets outclassed. Note that if you befriend the two Royal Guards in Hotland they will buy all of his Nice Cream, and you'll be all outta luck. Salty. You can purchase Popato Chisps from the vending machine in the 'lobby' of the True Lab. They're good for that area if you're in desperate need of healing during a battle with an Amalgamate, but they're otherwise kinda useless. A restorative item with a twist. Sea Tea increases your heart's movement speed, allowing you to dodge attacks more ably. It's useful so long as moving quickly is a good thing, which isn't always true in battle. I personally prefer not using them. You can trade a Sea Tea to one of the residents of the MTT Resort for 99 gold. If you decide to play Hard Mode in the Ruins at the beginning of a new game of Undertale, Toriel will leave a slice of this in your room instead of the Butterscotch Pie. Ew. One of the better healing items. During Neutral and Pacifist runs you'll receive a Snowman Piece from the snowman in Snowdin. He'll ask you to take it with you on your journey, and if you return to him with it in your inventory during the farewell sequence he'll be contented. You will receive three of these during the Genocide run, because you're a monster. Made of, for, and by spiders, in a joint Ruins and Hotland bake sale. Not terribly economic, and therefore not really worth getting, though Spider Cider can be used to instantly end the battle with Muffet. Also made of, for, and by spiders, in a joint Ruins and Hotland bake sale. A better choice over the Spider Cider if you plan to use it for a quick defeat of Muffet later in the game. Super expensive! Bought in MTT Resort, the Starfait is a ripoff for what it does. The only reason to buy these is to use them in the battle against Mettaton EX, as they boost ratings. Whoa. That's stupid expensive. Don't spend the money. Like the other MTT Resort items the Steak will boost Mettaton EX's ratings - gee, I wonder why - but you're much better off saving up for something else. You can only buy one of these. ... great. You can purchase these useless bits of confetti from the Temmie Village. There are three prices, but they all seem to do exactly the same thing, which is 'not much'. (You can make a profit by purchasing the one gold Temmie Flakes and selling them back, but... my god would that take a long time.) You can give Temmie Flakes to Temmies in battle, but... doing so... doesn't get you anything, really... just don't bother buying these, 'kay? Yep. Exactly what it sounds like. You'll get the Annoying Dog when you try to pick up the artifact in Waterfall, though it will only remain in your inventory so long as you stay in the room where you got it. Using it will trigger a really weird scene, as well as get you some Dog Residue. A phone. Toriel gives it to you early in the Ruins. You can use the Cell Phone to call people, though you'll only get much use of it if you allow a few of the area bosses (specifically Papyrus and Undyne) to live. Alphys later upgrades the Cell Phone, allowing you to access your Boxes and retrieve items without the need for a physical box. When you're selling Dog Residue it will appear as either 'DogResidu' or 'DogSalad'. DogSalad will earn you more, and you can occasionally gouge the Temmie vendor for a little extra. DogSalad can also restore your health... but if you try to use it, it won't divide. The only way to tell the difference between the two is to talk to the Temmie vendor. Oooo, how mysterious. You'll receive the Mystery Key from Bratty and Catty near the MTT Resort. It allows you to open the colourful house next to Napstablook's in Waterfall. You won't find anything of practical use inside, but there are lots of diaries to read that will fill in the backstory of one of Undertale's more interesting characters. Ooo, a freebie. Punch Cards are normally used to earn free Nice Creams from the Nice Cream vendor in Waterfall. Buy a Nice Cream, get a Punch Card. Submit three, get a free Nice Cream. It's wiser to keep the things, however, as you can use them as one-shot items to make your punches stronger during a fight. These are no longer available after you complete Waterfall, as the vendor packs up and leaves for Hotland. Undyne's second letter to Dr. Alphys, assuming you threw the first away. You cannot throw this one away, try as you might, and why would you bother anyway? Dog Residue and Dog Salad are actually separate items in your inventory. You do NOT need to visit Temmie to tell the difference. Dog Salads (If I remember correctly) heal either 2, 10, or full HP (Hit Poddles) on use. Temmie's a girl, so you might like to fix those pronouns. How do you know she's a girl? Anyway, in Undertale, everyone's called 'they'. UM, only frisk, and maybe the riverperson. And mettaton by muffet but thats pretty much it. You can tell this by the way they refer themselves or others do to them. So not everyone is gender nuetral unless they refer as so. Most character are also referee as him or her. Like Papyrus, Alphys and Mettaton. Yeah, but during boss fights, you get max health. Temmie is called "she" in the description box when she attacks you on the way to or from Temmie Village. That doesn't prove there aren't boy Temmies, but none of the others are referred to with a pronoun. There is a use for having 1g of Temmie Flakes on hand if you're walking back and forth from Temmie Village a lot: if you feed Temmie Flakes to Temmie when she attacks you, sparing her will win you 30g instead of 0. 29g profit! You could also win 40g by flexing, then sparing the Aaron that appears. What is the max inventory space in undertale again?